The Arizona Snowbowl is a ski resort on the western slope of Mount Humphreys, the highest among the Arizona’s famous San Francisco Peaks mountain range, which was formed by volcanic activity over one million years ago. The ski area is just 14 miles from Flagstaff, and 2 hours from Phoenix. With a base elevation of over 9,000 feet and a peak of 11,500, the resort offers 777 acres of skiable terrain over a 2,300-foot drop. 40 manicured runs traverse the resort area, the majority of which are suitable for beginner and intermediate skiers. Five aerial chairlifts include Arizona’s first 6-person high speed lift. Chair lifts operate during the summer months to take visitors on scenic rides. During summer guests may exit at the top to hike the peak. In winter, two additional surface conveyors take beginners to the top of the gentler slopes. With an average 240 inches of snowfall each year, the ski season normally runs from mid-November through mid-April. Three terrain parks include the beginner-friendly Prairie Dawg Start Park. This park is specially designed for first time terrain park skiers and offers low-profile snow features and boxes suitable for all ages. The Sunset Terrain Park is more suitable for advanced skiers and snowboarders. Expert level rails, technical jumps and snow features allow guests to show off their freestyle skills. The newest terrain park, Progression Park, is perfect for those who have perfected their skills at the Start Park, but are not quite ready for the more advanced features of Sunset Park. Just over 20% of the trails are marked as advanced, the longest of which is 2 miles. Advanced skiers may enjoy backcountry access to the Coconino National Forest. All backcountry skiers must receive a permit from the Flagstaff National Forest Service. Backcountry skiers should be advised that the San Francisco Peaks are home to at least 77 avalanche slide paths and the backcountry area is not maintained or patrolled. Dining options at the ski area include the Hart Prairie Restaurant, offering a food court, casual dining and a full bar, as well as the Fremont Restaurant and Bar, a new full-service bar opening in December 2017 at the base of the Sunset Chair Lift. The Agassiz Lodge Restaurant and Bar is located at the highest elevation. Breakfast and lunch are served there during the winter season only. History: Skiing arrived in Flagstaff in the early 1900’s. Norwegian brothers Pete and Ole Solberg were among the first in the area to ski. The two arrived in Arizona to work for the lumber industry in 1915 and would ride their handmade wooden skis down Mars Hill in the winter months. In 1935, Forest Service Snow Ranger Ed Groesbeck began the Flagstaff Ski Club, considered the pre-cursor to the Arizona Snowbowl. In 1938, with permission from the U.S. Forest Service, a road and a ski lodge were built on the west-facing slopes in Hart Prairie. By 1941, ownership of the area was transferred to Al Grasmoen and the Arnal Corporation. The deal was America’s first notable transfer of a special-use permit to a private entity. Grasmoen was a California businessman who soon after capitalized on the ski craze and built much of the infrastructure surrounding today’s Snowbowl. The area, which occupies land sacred to the thirteen Native American tribes in the region, has not been without controversy. 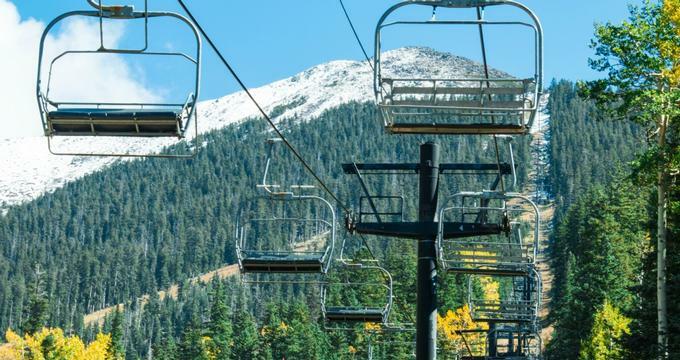 As the Snowbowl has expanded, tribal councils have filed, and lost, five lawsuits related to the construction of new roads, trails, ski-lift lines and sewage pipelines, as well as the biological effects of using reclaimed water to make artificial snow. Proponents argue the Snowbowl brings much-needed jobs to the area, and that tourism has a positive economic impact. Ongoing Programs and Education: A ski and ride school is available to those seeking lessons on either skis or snowboards. All instructors are certified by the Professional Ski Instructors of America Association or the American Association of Snowboard Instructors. Both group and private lessons are available for ages 4 through adult. Arizona Snowbowl offers some of the best beginner-friendly terrain in the southwest United States. What’s Nearby: The Ski Lift Lodge and Cabins are the closest lodging option to the Arizona Snowbowl and are located between Flagstaff and the ski area. The lodge is open year-round and offers 18 cabins as well as 6 motel-style rooms in the Ponderosa Pine forest.